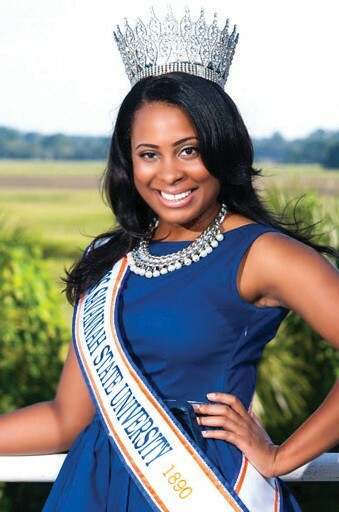 Morgan Taylor Wilson, a senior mass communications major from Norcross, Ga., will be crowned Miss Savannah State University 2014-15 during the annual queen’s coronation at 8 p.m. on Oct. 2 at Tiger Arena. The ceremony, which is part of the university’s Homecoming Week celebration, is free and open to the public. Wilson has been involved with numerous campus organizations including Sisters Striving for Excellence, the SSU Pre-Alumni Council and Tiger Ambassadors. In 2012, Wilson was elected as Miss Sophomore and later served as the Junior Class community service director, planning and executing various campus service events. A former HIV/AIDS peer educator for the campus, Wilson now serves as one of the new Freshman Year Experience peer mentors. After graduation, she plans to pursue a master’s degree in public policy or administration to prepare for a career handling crisis situations and responses. The attendants to Miss SSU include: Kristie Ferrell, Miss Senior, a mass communications major from Atlanta, Ga.; Miss Junior, Desiree’ Lewis, a biology major from Brunswick, Ga.; Chauntilena Butler, Miss Sophomore, a biology major from Augusta, Ga.; and Deja Watkins, Miss Freshman, an English major from Athens, Ga.